Adilabad, January 11, (way2newstv.in):In the agricultural market of Adilabad district, the sector is ready to purchase and buy them through FCI and Markfed. 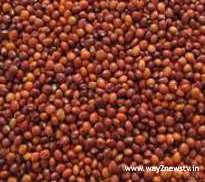 The government has announced a Rs 5,050-per-quintal queue for lentils. The process of acquisition will be taken by Marafe. Last year, the government announced a Rs.5000 support price for subsidized farmers. Merchants paid a maximum of Rs. 5,300 for quintals of support price. Compared to last year, this year the crop has grown in the district of Kilinochchi. With last year's high price, the farmers got good liveliness and earned profits. The farmers are likely to start buying in the Adilabad agricultural market tomorrow as they are engaged in more area this year. With regard to purchases, the concerned authorities are making arrangements without any problems. Shells needed to store the goods brought by the farmers in the marketplace. In addition to old sheds this year, the newly opened openshield was brought to the farmers by Rs 2 crore. When the farmers move in bulk, they are making arrangements to store the goods without any trouble. The central and state governments have put together the E-Nam policy in Adilabad farming market to sell the crops grown by farmers. The arrangements have been completed. Marketing officials have prepared the necessary arrangements for the purchase of ladders through the E-Nam system. The scheme will be launched to provide midday meal to the farmers who come to market. The ISC is planning to provide only Rs 5 a meals. If the scheme is available, farmers can not get food in the hotels outside. Only five rupees are available to farmers.